On TV and in films, and even in many novels, writers are often – if not almost always – portrayed as high-profile media types, living the high-life, traversing here and there in sharp suits and fancy dresses, to interviews, readings, launches and high-profile media events. they’re inevitably best-sellers, and vaguely eccentric, and live in nice, even vaguely grand homes or apartments (if they’re American): they get stopped in the street (and, if you’re Castle, at crime scenes) by fans who simply love your books, live and breathe your characters and want to marry you., or at least have an affair. Now, I’ll be the first to admit that the literary circles I move in are toward the lower end of the industry. By which, of course, I actually mean they exist outside of ‘the industry’. They work regular jobs, have families and chisel out their works in stolen hours late at night and early in the morning. They do it out of compulsion, a need to purge and splurge, rather than for the money. It almost goes without saying I count myself amongst these. Writing isn’t some hobby or light-relief pastime. The writers I know and associate with are, believe it or not, more representative of writers than the popular portrayals of writers. With a few notable exceptions – Stephen King, JK Rowling, for example – writers tend to be fairly anonymous. Unlike actors, writers don’t get their faces splashed over huge billboards. Writers aren’t usually the most photogenic of people, which is often why they’re writers and not actors. Do you know what E.L. James looks like? Dan Brown? John Grisham? Jodi Picoult? Donna Tartt? Toby Litt? And these are ‘bestseller’ list authors, not the majority of people who constitute the world of publishing in all its guises. It’s ironic that actors get paid megabucks for playing out the scenes laid out in the pages of books penned by anonymous writers, and earn significantly more for doing so, given that without the writers, the actors would have no scenes to perform. it’s all about having a face and an image that sells. ‘Game of Thrones’ author George R.R. Martin didn’t get rich posting selfies and posing for Vogue. Fiction is often escapist: it doesn’t have to be fantasy or sci-fi to take the reader beyond the confines of their hum-drum daily existence. And so it may be that even writers who earn royalties of pence and cents may portray high-living celebrity writers in their works. I have no gripe about that, per se, other than the observation that it flies very much in the face of the first principle of writing, which is ‘write what you know.’ This doesn’t mean fantasy and science fiction are out by any stretch, so much as that it pays to at least research scenarios that exist beyond your knowledge, because a savvy reader can spot a bluffer. Research plus imagination is, of course, another matter entirely and can be the very essence of creative genius. As such, I resist the urge to yell at the TV when ‘celebrity’ writers are portrayed. Of course, my initial thought is ‘when do these people get to do any writing, given the time they spend travelling around to premieres and being famous?’, but the answer is obvious – namely, the rest of the time. Because unlike the writers I know, they don’t work the 9-5, and their maids and the like take care of the kids while they swan round in the name of ‘research’. This is nowhere near a luxurious salary. It’s not even minimum wage. It’s certainly well below the £16,850 figure the Joseph Rowntree Foundation says is needed to achieve a minimum standard of living. It means that writers don’t live in palatial mansion-type homes, resplendent with antique furniture (unless they’ve inherited it) or plush penthouse apartments. They may have heaps of books on their shelves (the majority likely either purchased second hand or sent to them for review or in trade) but the chances are most writers don’t rise around brunchtime and slip on a silk bathrobe before a serving of eggs Benedict and then chip out a page or so while sipping sherry or 50-year old single malt in their resplendent superbly plush leather-upholstered chair at a Louis XIV desk in the prime spot in a mahogany-panelled library. No, writing is work: hard work, even for ‘successful’ authors. And given that in the region of 99% of all books published sell fewer than 100 copies, what hope is there fore the rest of us to break through to the major league? The rest of us – the writers who can’t even qualify as ‘professional writers’ and who are obliged to work for a living and write on the side, in their spare time… well, what about us? We may be by and large fringe producers of culture, but collectively account for much of the vital undercurrent that breaks new ground and ultimately inspires the commercial mainstream. We’re the lifeblood. We stay up late, typing with our eye bags instead of our well-manicured fingers, using stolen moments to render those ideas that poke and prod and gnaw at us during the ours of the 9-5 into words that will ultimately purge us of the torment of drudgery. Some, perhaps maybe many, harbour ambitions of the palatial mansion-type homes or plush penthouse apartment with a capacious library suite and luxurious office. Maybe they’ve bought the fictional representation of the author, like the office temp I worked with once – a guy in his early twenties who was convinced he could pen a novel that would become lauded as a literary masterpiece, after which he would never have to work again. I didn’t delight in shattering his illusions, and equally, I don’t delight in the author’s plight, because it’s my plight as much as the next minor-league author’s. This isn’t about highlighting that plight, either. It’s not a grumble and grouse about how artists don’t reap the rewards they deserve, but a meditation on the vast disparity between the fact and the fiction. And what beggars belief is that the fiction, as presented in the media, of the wealthy, famous and esteemed author, is propagated by authors at all levels. After all, ‘big’ films, TV dramas, series and the like are as likely to be penned by breakthrough authors, who are accustomed to the real world rather than the privileged world of the top flight. Where do they get these ideas from? Is this the real life? Is this just fantasy? Caught in a landslide, no escape from reality. Open your eyes, look up to the skies and see… Originality is dead. Legend and myth isn’t the life of the author. You’re not Stephen King, you’re not Castle. This is not ‘Murder, She Wrote’. This is life. Now write it. 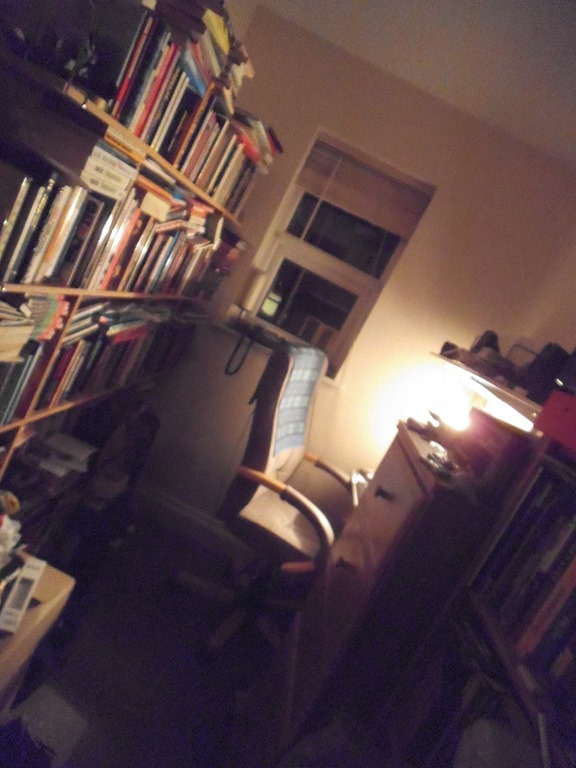 Cramped, cluttered and anything but the image of a palatial literary person’s writing space…. the ‘office’ of part-time literary nonentity Christopher Nosnibor, today.